What happens if the government loses the vote? After all the ups and downs of the past few weeks, a Brexit deal is finally on the table. Assuming Cabinet signs it off today – which given the lack of ministerial resignations overnight, appears likely, then an ad-hoc EU summit will reportedly be set up for around the 25th of November to sign it off formally. Still, the big question now is whether or not the Prime Minister’s deal can gain enough support for it to be approved in the House of Commons - and the answer looks just as uncertain as ever. To understand why, we look at how the three key factions of Parliament might vote, what would happen if May loses and what all of this means for the pound. The Northern Irish party, who the government relies on for its majority, has been critical of the reported deal. They have long been concerned about the initial proposal for the Irish backstop, where Northern Ireland would remain in the single market for goods and a customs union on its own if the UK as a whole chooses to leave those mechanisms. As the agreement has not yet been fully published, it's unclear exactly how much of this has ended up in the final deal. Nonetheless, to alleviate fears that the backstop could lead to a customs and regulatory barrier between NI and the British mainland, Reuters is reporting that the agreement will give the UK a choice. If no improved trade deal has been reached by July 2020 (five months before the scheduled end of the transition period), then the UK can either opt to extend the transition or enter a 'bare bones' customs arrangement with the EU. The latter option could help get around the need for tariff payments and would also see the UK align itself to certain key elements of EU law, but may still require certain goods to be checked against European standards when passing between NI and the rest of Britain. While various efforts have been made to reassure MPs that these checks could be 'de-dramatised', the Democratic Unionist Party (DUP) have remained unconvinced by the plans. It's not yet clear what they make of the final deal, but recent rhetoric suggests there is a strong possibility they’ll oppose the agreement when it is voted on in Parliament. Even if the compromise on the Irish border is enough to convince the DUP, pro-Brexit MPs within the Conservative Party remain deeply sceptical. These lawmakers, who include former ministers Boris Johnson and David Davis, are worried the proposed options - the customs plan or a transition extension - would effectively keep the UK attached to the EU indefinitely, without a say in European law-making. For this reason, much of the recent focus in the negotiations has been on agreeing to a withdrawal mechanism for the backstop. The Brexiteers have said they want to see a unilateral method to extract the UK from the Irish backstop in future– but although we don’t yet know what has been agreed, it’s unlikely the EU will have signed up to that. So while nobody knows exactly how many Conservative MPs would be prepared to vote against the government, it is likely some will. For instance, David Davis implied a couple of weeks ago that he would be inclined to vote against the deal to force Theresa May to go back to the negotiating table to get an improved offer. Senior Labour lawmakers have long indicated that the proposals being pursued by the government would not pass their six tests and will, therefore, vote against the deal in Parliament. This is partly based on the belief that this would trigger a snap election. That said, the government may be hoping that the reported customs arrangement plan may bring some Labour MPs on side - after all, it's not so different from their own Brexit vision, which would see the UK remain in a customs union with the EU. Reportedly, the deal will also align the UK with the EU's employment and environment standards, which may also be attractive to some opposition MPs. If nothing else, Theresa May might also be banking on some of these lawmakers baulking at the prospect of 'no deal', given the risk to jobs and the economy. Whether any of this will be enough to get some or any, Labour MPs onside in the Parliamentary vote is still very unclear. While nothing has been confirmed, the consensus is that the deal will be put to MPs in mid-December before the Christmas break and the odds of the government losing appear high. In this case, one possible scenario is that Parliament votes for a snap election. For this to happen, two-thirds of MPs would need to vote in favour of a no-confidence motion, which implies that a large chunk of Conservative lawmakers would need to support the idea. To us, this seems unlikely. While many Conservatives may oppose the deal, a snap election could feasibly see Labour elected into power, who may well opt to pursue a much softer stance on Brexit. This option may appear even more unattractive to Tory Brexiteers than the deal itself. But even if an election doesn't take place, then the political pressure for Theresa May to return to the negotiating table is likely to be immense. The problem is that the EU is unlikely to be in the mood to shift position – particularly on the legally-binding issues such as the Irish backstop and the UK’s financial liabilities. So apart from some cosmetic changes on the political declaration – a vague document that will outline the ambition for future trade talks – it’s unlikely that Theresa May will be able to yield many more concessions. That said, if a slightly-amended deal was put to Parliament on a date much closer to March, then with little (if not no) time to go back to the negotiating table, MPs may feel obliged to vote through the agreement, simply to avoid the economic risks presented by the ‘no deal’ scenario. 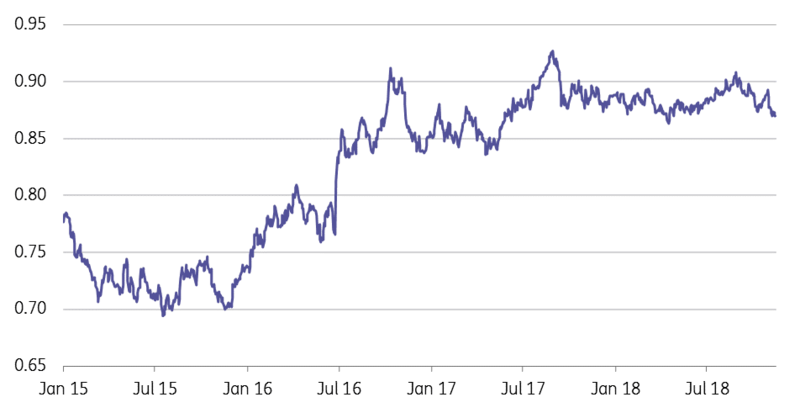 EUR/GBP has now declined around 4% from the highs seen in late August, largely due to the chances of a 'no-deal' Brexit becoming slightly less likely. We continue to see the GBP proposition as quite binary, i.e. a virtuous circle of less risk premia and rising UK money market rates combining to deliver a positive outcome for GBP – or the vicious opposite. That said, we still think GBP is highly under-valued against the EUR, and we’re not looking for another 15-20% GBP decline in the event of a no-deal. Currently, the market prices around 50 basis points of Bank of England tightening over the next two years and we think that could shift to pricing 100bp – were the withdrawal bill to be approved by parliament. That would certainly be worth a EUR/GBP move to 0.85 in our opinion – but not too much more. In fact even an approval by the UK Cabinet could be worth a little more strength to GBP in the short term. 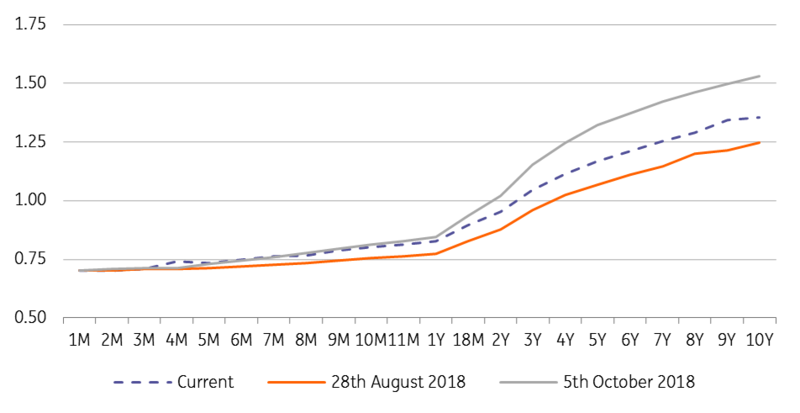 As the chart below shows, the UK money market curve has steepened from the low levels seen in late August (when EUR/GBP was nearly trading at 0.91) but is still some way off the levels seen barely a month ago. We still think the scenario analysis we presented over the summer, shown below, is a good way to look at the near-term prospects for GBP, where progress on negotiations could see two central bank hikes priced in 2019 and EUR/GBP trade to 0.85. However, for cable, a stronger dollar probably means that progress on GBP/USD is only limited to the 1.33/35 area – rather than the 1.36-38 area, we had originally thought possible when we put this scenario matrix together.